August 15th is when this class starts over on my doll network at ning. Come on over and join for only $30.00 you will learn the techniques in making this simple jointed sweet baby doll. good luck with your workshop. Don't let us get sick. Don't let us get old. Don't let us get stupid, all right? Just make us be brave. And make us play nice. And let us be together tonight. I love people. I love my family, my children...but inside myself is a place where I live all alone and that's where you renew your springs that never dry up. Ultimately, my hope is to amaze myself. The anticipation if discovering new possibilities becomes my greatest joy. Image may be used for your artwork only. Please do not reproduce and sell. Each digital is 5.00. You may use things stamps in your artwork but your may not reproduce them for sale. 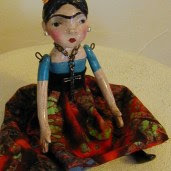 Interested in taking the polymer clay folk art doll class? Cost is $40.00. Paid through pay pal. You will be sent an invitation to a private class that teaches you the simple techniques of making this folk art doll. I have always been an artist. I am an artist because I do not have a choice in the matter. It is as though art chose me as opposed to the opposite. Many times during my evolution I have thrown away all my art supplies only to get employment in the business of art. I have dabbled in many mediums. I am self taught. I made a conscious decision not to be "trained" in art for fear of losing my spontaneity. I have evolved from commercial art to doing "one of a kind pieces". I am inspired by color, form and texture. I am fascinated by faces (mainly feminine) and the human condition.My art has a child like feeling and I hope that I can maintain that approach as I evolve. My aspirations are to spend my time doing art and hopefully make my living at it. I believe art is a healing process for many of us who were wounded children.